This is the last revisit to my old place. It was nice to go back but you can't live in the past. It's time to move on. 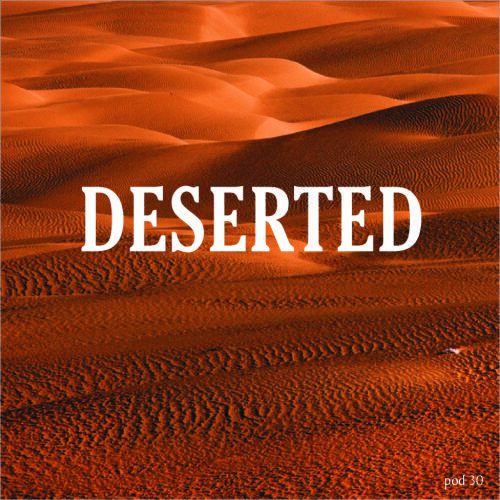 'Deserted' was actually the last podcast I posted back then. I had others planned, but the lack of hits and downloads I was getting got me down and I jacked it in. It may have explained the difficulty I had in finding stuff to write about (as I explain below). Of course, this means I now have to come up with something original rather than digging up old stuff. Better get to work then. In the meantime, enjoy the final pod. The words, as ever, remain untouched from the original post nearly FOUR YEARS ago! I've had this pod ready since before I published the last one. Trouble is, inspiration deserted me when it came to words. Deserted: good word. My mind has been a lifeless desert while trying to write this piece. No camels, no nomadic tribes, not even an oasis of ideas. My muse turned to sand - thousands of square miles of the stuff and not much else. The Pod 29 cassette thing came to me all of a sudden. I hoped the same thing would happen again. But it didn't. It's not the first time I've suffered from writer's block, but it's never any less frustrating. What makes it moreso is that I have plenty more podcasts lined up, just very little in the way of text to go with them. There's one featuring acoustic versions, one of some 'lost singles' I recently rediscovered, and I'm now up to five pending re:Coverings! That's not to mention plenty more delightful odds and sods pods like this one. I hope my muse returns soon, but she can be an awkward bugger. If you read the NME during the 80s and early 90s, you will be familiar with the work of Steven Wells, someone who may well have suffered from writer's block in his time, but probably just dealt with it by writing lots of swear words. Love him or hate him, you could not ignore his inimitable, abrasive style which inevitably contained many expletives and the use of his Caps Lock key. His last job was with the Philadelphia Weekly where he wrote of his fight with cancer whilst remaining as hilarious as ever. He sadly lost his battle in June 2009. Akira The Don, often erroneously referred to as a 'Welsh rapper', despite being born in the Midlands and nowadays living in London, paid tribute to 'Swells', one of the best writers of his generation, with this single. It pretty much sums up one of my journalistic heroes to a T.
Released when she was just 19, Meinir Gwilym's debut got the critics wetting themselves. Sadly, very few outside the Welsh-speaking heartlands have ever heard it. These days she's a presenter on S4C, though a new album is in the works. Yay! This quirky Scottish lot were actually around longer than I thought. I don't know why I lost touch with them after their early singles and debut album as they were as different a band at the time as any. They split in 2007 after 10 years together. The story of Sleepy John Estes (as are those of many legendary bluesmen) is an intriguing one. I'll leave you to look it up, but nevertheless his influence was lasting. Bob Dylan referred to him in sleevenotes, and his songs have been covered by the likes of Led Zeppelin, the Kinks, Ry Cooder and Eric Clapton. This early recording was made a couple of years before a two-decade hiatus. A phenomenal live band (at least they were when I caught them back in 1994), Senser blend old-school hip hop with dance music and thrash metal. A potent mixture for sure, but throw in a heavy dose of political and social comment for good measure, and you can expect some sort of explosion or another. Admittedly, this track leans a little more towards the thrash side of things, but I'm not apologising for that. Rock it most certainly does! My favourite album of 2012 so far is the debut offering from Beth Jeans Houghton. It's a veritable treat of idiosyncratic pop that blows much of everything else I've heard this year out of the water. It's certainly a little more unconventional than her early stuff, like this pretty little country tune from a couple years back, but even here there's a distinct hint of kookiness straining through. Seminal. There's a word that accompanies pretty much any reference to Wire's first three albums ('Pink Flag', 'Chairs Missing' and '154'). It is an overused word, but in this instance, it couldn't be more accurate. Defined as "highly original, influential and important... something fresh and unusual", it tells us all we need to know. I find it very difficult to pick a favourite out of the first two Wire records, they're both pretty special. Hmmm... nope. Can't do it, sorry! There have been many versions of Mike Nesmith's 'Different Drum', and I have yet to hear a bad one. I suppose it's hard to screw up such a great song (though I haven't heard Pete Burns' attempt, I have to admit). The most famous is the 1967 smash hit by the Stone Poneys, fronted by a young Linda Ronstadt. The Lemonheads, being no strangers to covers, make a decent job of it. But as I said, it's hard to screw it up - it is such a great song. I love the dark, swampy nature of Gallon Drunk's music. It's hard to believe they're British and not American. This particular song sounds not unlike something Nick Cave might have come up with at some point. Funny then that frontman James Johnston later became a member of Cave's Bad Seeds. Still got this one. Always found something I've never heard before in your pods. You should think about doing the occasional pod for this blog. A few really fun songs on Alvin Lives (In Leeds). Haven't pulled that one out in a while. You are so right about Different Drum. Have been preaching that one until I'm blue in the face... about Nesmith in general, actually. Those early Wire albums are really special. In other words, great podcast!